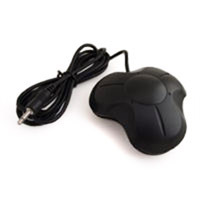 This product is a complete hands-free mousing replacement offering cursor control, regular clicks and additional programmable actions. 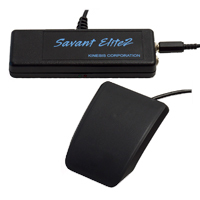 'Program Specific' commands can be set by utilizing the downloadable Footmouse Assistant Software. 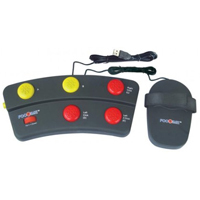 The unit works plug and play out of the box with a vertical scroll wheel (orange wheel, lower left), left click (red button, lower centre), double left click (red button, lower right), right click (red button, upper right) and 2 programmable buttons (yellow, upper centre and left) which can all be assigned specific commands using the Footmouse Assistant Software. The user can also make all 5 buttons programmable by toggling a yellow 'enable programming button' on the side of the unit. 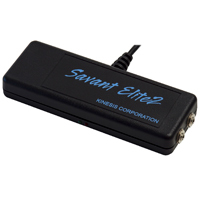 The buttons are 1.5" in diameter and have a crisp tactile mechanical switch rated at 500 grams. 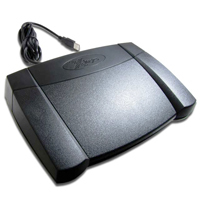 Cursor movement is achieved by sliding your foot into the 'slipper' which has an 800 DPI optical sensor on the underside, and moving the slipper around on an oversized 'footmouse' pad which is 15.5" wide and 11" deep. The 'slipper' is 4.25" wide by 7" long and has an adjustable velcro strap to ensure any size foot is accommodated. 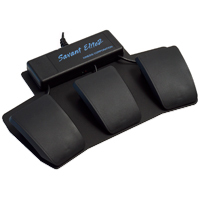 This product allows you to shift the effort of mousing on your computer from your hands to your feet as a complement to traditional mousing solutions. NOTE: It is not recommended to use this device as a primary mousing device but only for occasional mousing. 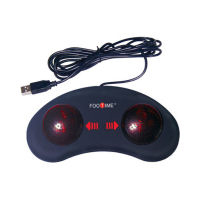 NOTE: On some computers, there is an issue where the Footime unit may at times go to 'sleep' and then not wake up until you unplug and re-plug the device. Often plugging in the unit through a hub will alleviate this issue, but not always. The manufacturer is aware of the issue and is working on a fix of this for the next generation of the product, but there will be no 'fix' for the current generation. Unfortunately we are not able to identify the exact source of this problem and as such cannot advise whether you may experience this issue, however as it always is resolved by unplugging the device and plugging it in again, it isn't a serious issue (although it is inconvenient). 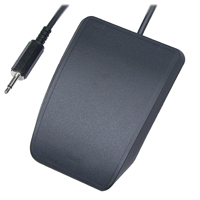 The BiliPro Page Turner from BiliPro Inc. is the ideal solution for those who need to turn 'electronic' pages on their computer without using their hands and is commonly used by performing musicians as they can control the turning without reaching for the music or relying on an assistant. 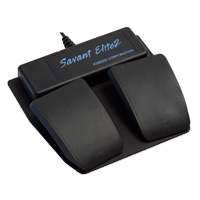 It has two pedal buttons that move your pages forward or back by generating the Page Up and Page Down keystroke commands on your keyboard. LED lights illuminate the pedals for easy locating in the dark. The base is made of solid metal and has rubber stoppers underneath to prevent sliding on the floor. Music Score Software which is known to work well with the FooTime Page Turner includes the following: Mac & PC: Scorewriter by Geniesoft, Overture by Geniesoft, Encore by GVox, Finale by MakeMusic, Sibelius by Avid, and MusicReader by Leone. iPad Apps: ForScore, GigBook, OnSong, MusicReader, and UnRealBook. The Page Turner is not a programmable unit i.e. 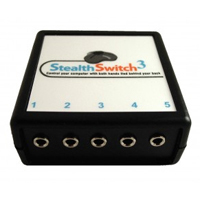 the switches will only generate PgUp and PgDn.